Huge Turnout for LPC Hearing!! 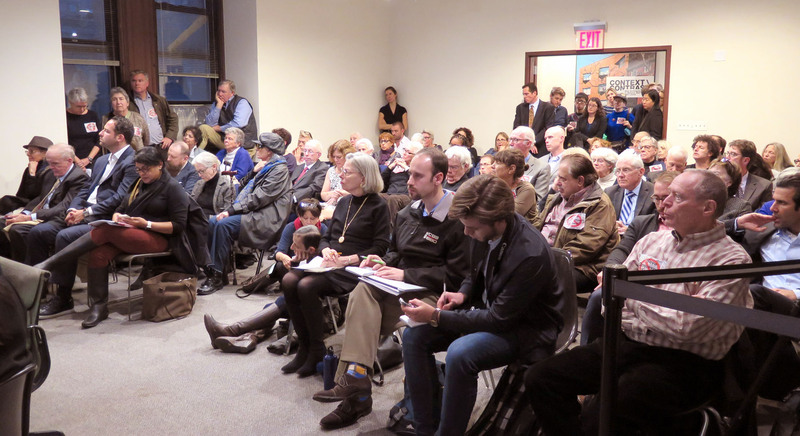 Thanks to your help, we rocked the Landmarks Preservation Commission hearing last Tuesday! 150 people turned out to show support. That’s amazing turnout for a rainy workday afternoon in a location far from our community. 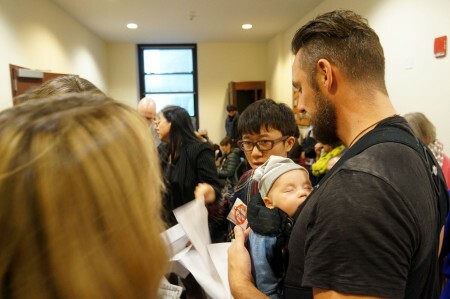 The hearing room was completely full, and the foyer outside was packed – there were even people waiting in the hallway outside the foyer. About 50 people testified; only two of these people spoke in favor of the project (and one of the two was a near-by property owner). Assemblymember Deborah Glick testified in person speaking on behalf of herself and State Senator Brad Hoylman. Borough President Gale Brewer and Councilmember Corey Johnson sent members of their staff to testify. Both Save Gansevoort and the Greenwich Village Society for Historic Preservation had multiple speakers, and the New York Landmarks Conservancy, Landmark West!, and Historic Districts Council presented statements opposing the project. Together, we all made a powerful argument that the Gansevoort block is defined by it’s market history and character, and that, quite simply, the proposed development would obliterate that character and history. The testimony lasted until 7:00PM! Given how late it was, the LPC Commissioners decided to adjourn the hearing and postpone their own discussion and questions to the applicant until a future meeting. Since none of the Commissioners had the opportunity say a single word about the proposal, for now we have little idea what they currently think about this project. WE WILL NEED PEOPLE TO ATTEND THIS FUTURE MEETING TO REMIND THEM HOW STRONGLY THE COMMUNITY OPPOSES THIS MASSIVE DEVELOPMENT! The public will be able to observe this meeting but will not be able to speak. We’ll post the date and time of this meeting as soon as it’s available. Let’s keep the pressure on! The Commissioners listen to the presentation by the developer’s architect. There’s a lot of paper on that table! Exhausted after a hard day of testimony! So does an unspectacular yet wholly unique row of buildings render the block between Greenwich and Washington Streets sacrosanct, or is it out of place? With everything around it being transformed, is that all the more reason to redevelop the strip, or to rescue it? It’s pretty obvious which answer the Landmarks Preservation Commission should give! 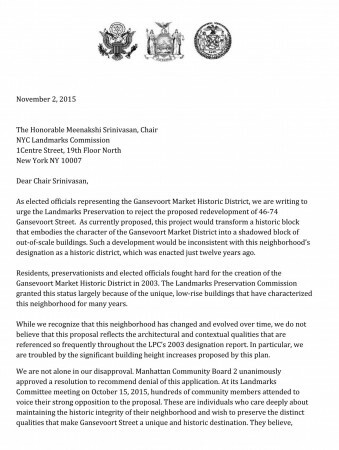 The all-important Landmarks Preservation Commission hearing on the proposed massive Gansevoort Street development will be this coming Tuesday, November 10. This is the big one! It is the only public hearing that the Landmarks Preservation Commission will hold before deciding whether to approve or deny this plan. Entrance on South end of building near subway station, ID required for entry. 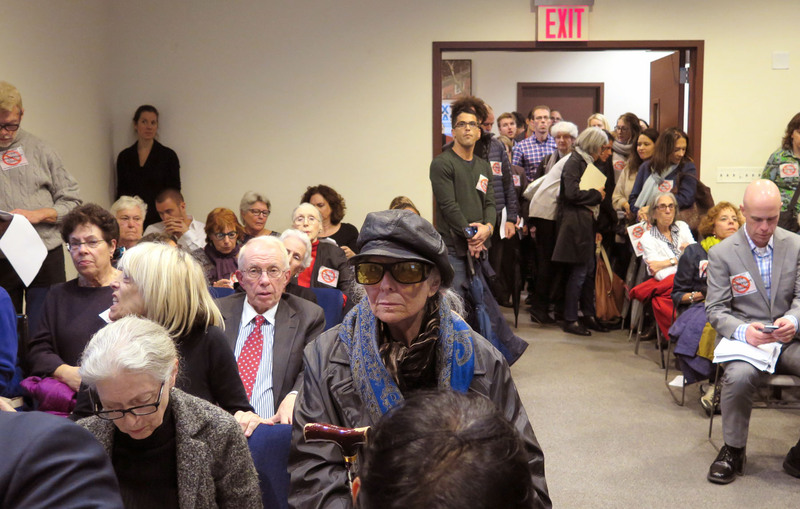 We need your help to pack the hearing room. Nothing is more powerful than a strong turn-out of community members expressing their opposition to this project. 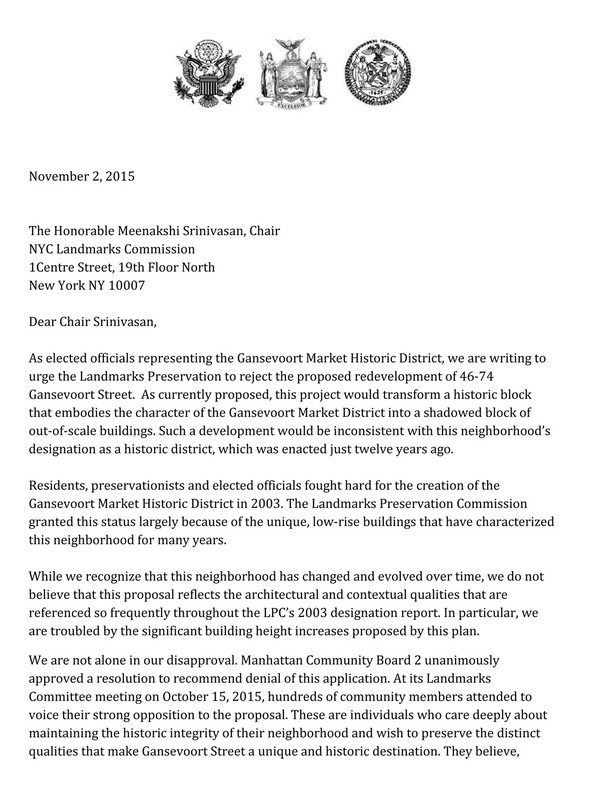 Join us and tell LPC why you believe this plan for a massive transformation of landmarked Gansevoort Street would destroy the historic character of the district. Even if you don’t wish to speak, it’s important that you be present. We will have stickers for people to wear to display their opposition to this proposal, and you will be able to state that you oppose the proposal when you sign in. 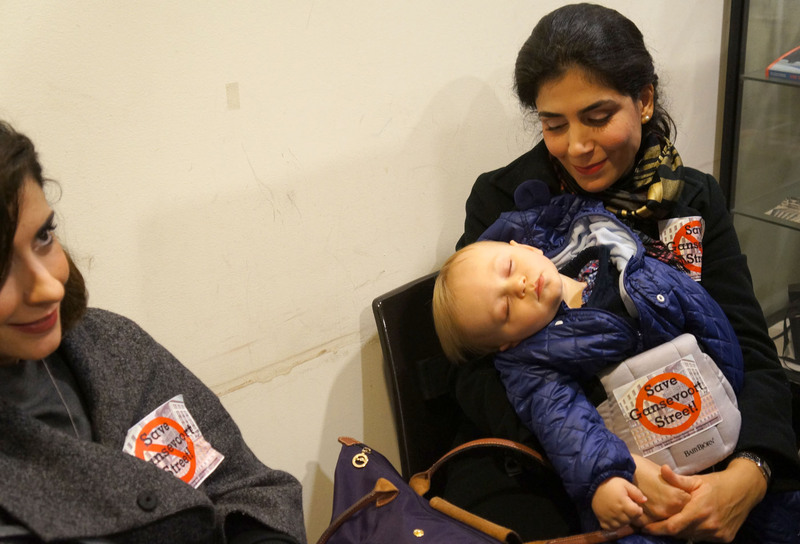 If you can’t come when the hearing starts around 3:30, please come later – you will be able to speak if you sign in before 4:00 pm, and you will be able to enter the hearing room and show support if you arrive before 5:00 pm. See you at the hearing!! A new proposal by BKSK Architects would seek to alter an entire row of the districts edge- one full block and either alter, or completely eradicate the century-old structures to replace them with 122 feet of vertical development. There are of course, times when alterations to landmarks are appropriate but assembling a full block within a known historic district should not be carte blanche to start from scratch. Read their full statement here, and their testimony before the Landmarks Preservation Commission here. 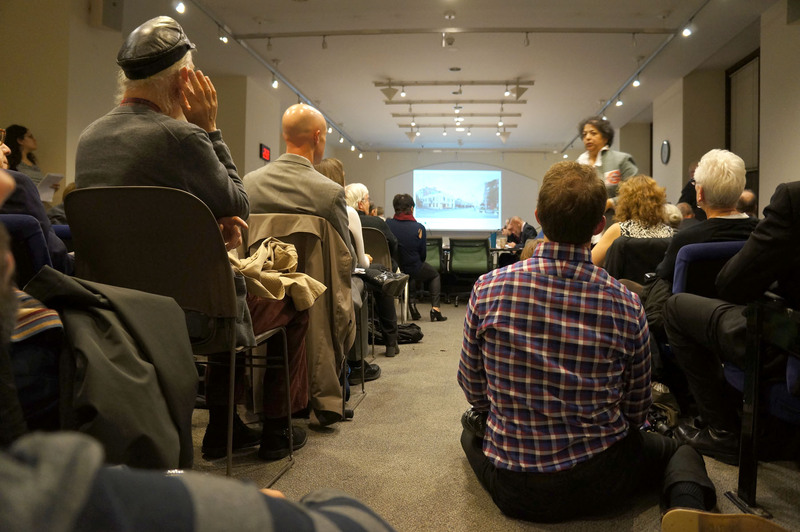 The New York Landmarks Conservancy, one of New York’s foremost city-wide preservation organizations, has announced its opposition to the proposed massive Gansevoort Street development! The project seeks to alter [Gansevoort] Street’s historic character beyond recognition. 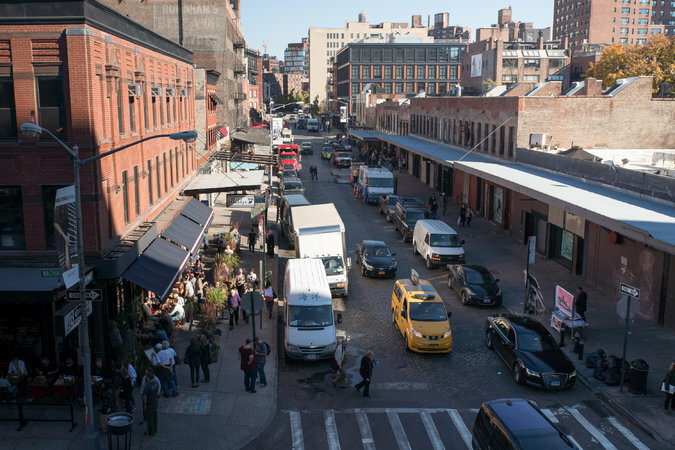 The new, much taller buildings are entirely different from the historic buildings that line the street today and that are described in detail in the Gansevoort Market Designation Report. The proposed buildings are not appropriate in terms of their scale and design. Their facades have a modern residential character that is incompatible with the street. While the redesign of the historic ground floor facades raises its own issues, the Conservancy’s chief objection is to the new buildings which would erase the character-defining scale of the block and substitute it with a group of modern apartment buildings that are inappropriate to the historic character of the Gansevoort Market Historic District in terms of their scale and design. All of Our Local Elected Officials Announce Opposition to Massive Gansevoort Plan! It’s a grand slam! 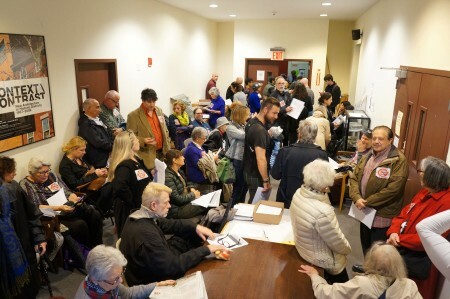 Borough President Gale Brewer, NYC Councilmember Corey Johnson, State Assemblymember Debora Glick, State Senator Brad Hoylman, and US Representative Jerrold Nadler have issued a powerful letter announcing their opposition to the proposed massive development on Gansevoort Street. As currently proposed, this project would transform a historic block that embodies the character of the Gansevoort Market District into a shadowed block of out-of-scale buildings. Such a development would be inconsistent with this neighborhood’s designation as a historic district, which was enacted just twelve years ago. Residents, preservationists and elected officials fought hard for the creation of the Gansevoort Market Historic District in 2003. 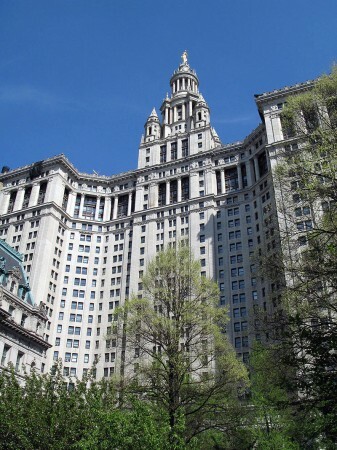 The Landmarks Preservation Commission granted this status largely because of the unique, low-rise buildings that have characterized this neighborhood for many years. While we recognize that this neighborhood has changed and evolved over time, we do not believe that this proposal reflects the architectural and contextual qualities that are referenced so frequently throughout the LPC’s 2003 designation report. In particular, we are troubled by the significant building height increases proposed by this plan. Thank you so much Congressman Nadler, Borough President Brewer, Councilmember Johnson, State Senator Hoylman, and Assemblymember Glick! 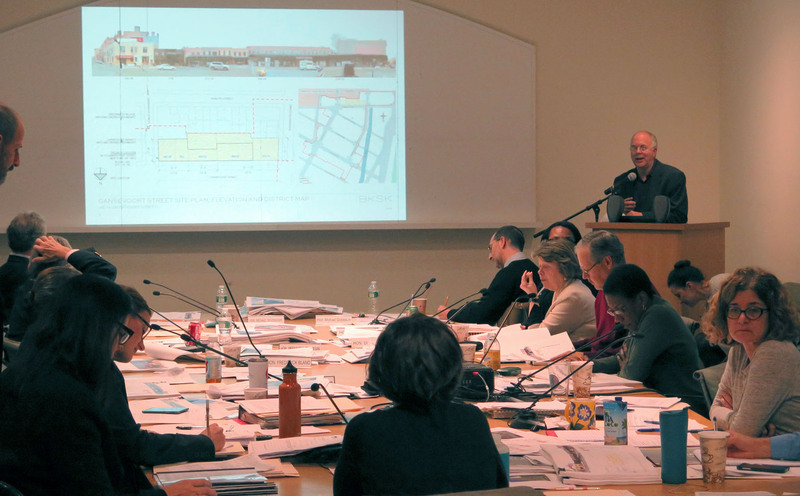 Community Board #2 has given a unanimous thumbs down to a massive development project proposed for Gansevoort Street in the landmarked Meatpacking District. It will destroy the character of this historic and unique neighborhood. 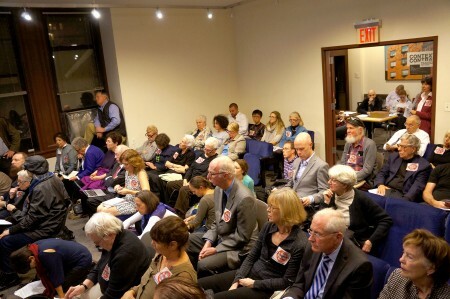 Please go to the Save Gansevoort website – www.savegansevoort.org – to sign our petition urging the Landmarks Preservation Commission to reject this proposal and to get regular updates. Join us at the LPC meeting on November 10th and be heard!